Anyone injured in a truck-related accident should call an experienced St. Paul personal injury lawyer as soon as possible. It is important to preserve evidence of the crash and a person's recollection of the accident so you can obtain the maximum compensation to which you are entitled. 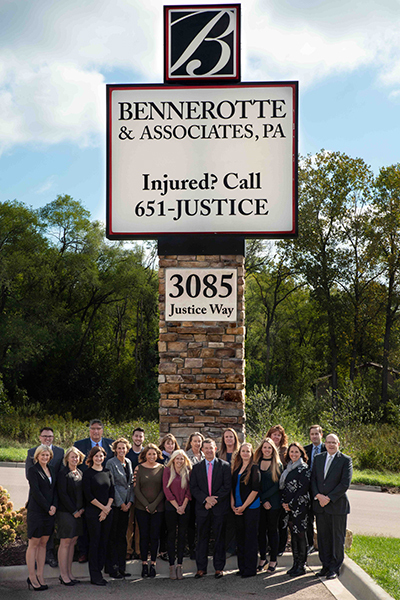 At Bennerotte & Associates, PA, our team of experienced lawyers is prepared to discuss your situation and help replace lost wages, cover medical expenses and obtain compensation for any other losses that result from a serious injury. Our office is conveniently located in Eagan, just a short distance from the Mall of America, and is a short drive from Minneapolis and St. Paul. If your injuries prevent you from visiting our office, however, we will arrange to meet at a time and place convenient for you and your family. We hold negligent truck drivers and their employers accountable. Please contact our St. Paul trucking accident lawyers online today to arrange a free, confidential consultation. You may also call our firm at 651-JUSTICE (651-587-8423). Semi trucks have the ability to inflict serious damage to people and property.Truck accidents are often the cause of some of the most serious injuries seen on Minnesota's roads, even causing death on numerous occasions. As a result, all truck drivers must exercise extreme caution and engage in safe driving behaviors to protect other motorists from serious harm. Truck drivers are typically paid by the mile, which could motivate them to ignore safety rules and regulations. Examples of this include failing to keep a proper log, speeding, driving on too little sleep or taking drugs to help them stay awake. We will get to work immediately to determine the true cause of your accident. If we determine that a truck driver was negligent or erred, we will aggressively pursue maximum compensation on your behalf. Trucking companies and parts manufacturers can also be held liable for a person's injuries. In the past, companies tried to limit their liability by distancing themselves from their drivers. Today, any company that owns a trucking permit can be held liable if it failed to properly maintain the vehicle or engaged in other negligent behavior. Manufacturers of parts such as tires can be held liable for defective products that led to an accident. Do not delay if you or a loved one has been hurt in a semi truck crash. Contact the attorneys at Bennerotte & Associates, P.A., as soon as possible to be sure you receive the full benefits rightfully due to you. Call us at 651-587-8423 to set up a free, confidential consultation. You may also contact us with our online form.